When it comes to Laptop - Desktop Batteries - the 83H6193 IBM replacement battery provides the power you need when you need it. The 83H6193 is constructed with performance and quality in mind. Equaling or exceeding the original manufacturer's specifications for your equipment at an affordable price is a hallmark of IBM. With thousands of batteries to choose from and extremely low prices you'll see why BatteryTex is your one-stop-shop for replacement batteries. 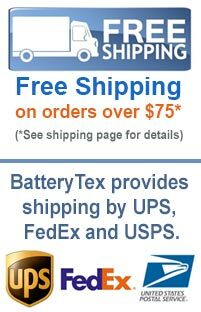 Whether its selection, quality or our great discount prices you'll find that BatteryTex is the ultimate battery source. BatteryTex (M-Tronics) is a family-owned battery supplier since 1977. Give us a call with any questions or for information on bulk discounts - 1-888-825-6661. More great brands of Laptop - Desktop Batteries batteries available here. We stock a great selection of items for IBM products. Click here to see. Better materials, modern manufacturing techniques and greater overall efficiency mean better batteries at lower costs. If you want to find the warranty information and timing on a particular battery please contact us.